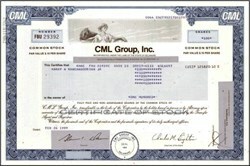 Beautifully engraved certificate from the CML Group, Inc. issued in 1999. This historic document was printed by the American Banknote Company and has an ornate border around it with a vignette of an allegorical woman. This item has the printed signatures of the Company’s Chairman of the Board and Treasurer. CML Group, Inc. operates in two business segments; NordicTrack, Inc. and Smith Hawken, Inc. NordicTrack designs, sources and sells physical fitness, exercise equipment and other health-related products and Smith Hawken sells gardening tools, work wear, outdoor furniture, plants and accessories. These products are sold through company-operated retail stores, mall kiosks, mail order catalogs and on the internet. On November 5, 1998 two of the company's subsidiaries, NordicTrack and Nordic Advantage Inc., filed petitions seeking protection under Chapter 11 of the United States Bankruptcy Code. Nordictrack accounted for 68% of fiscal 1998 revenues and Smith & Hawken, 32%.